1995, 2.4 turbo diesel intercooled 6 cylinder with 95ps. 132k miles, full service history with recent cam belt and water pump. 5 speed manual with power steering, electric windows and this last of the range is sought after. Excellent camping interior, offering 6 belted seats including a 3 point in rear , large 4 berth although upper bed is big enough for 3 children. Fully winterised with extra insulation, double glazed windows with blinds and curtains, independant heating, 3 way fridge, gas cooker hob, hot water boiler, full wet room in once piece polycarbonate with shower and loo, vanity mirror. Twin rear rock n roll beds located on variotech rails also allowing forward facing twin seats. Leisure battery, 240v mains supply, RCD and charger unit. Under slung LPG gas system easily filled at most motorway services, 12v strip lighting, truma hot water boiler, propex blown hot air heating on thermostat. 2 sinks, 2 tables, masses of storage space. Top box and bike rack complete this vehicle. 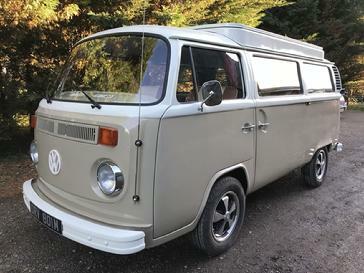 1972, fully restored T2 with high end Airteriors internal cabinets and trimming. Type 4 Porsche modified engine with 150ps. Extensive list of upgrades with no expense spared. Enquiries to andy@campervans4u.com for full spec sheet and viewing appointment. First registered in April 1990 in Germany and imported into the UK in 2007. Complete mileage is 120,000 miles. Recently fitted with a AAZ 1.9 turbo diesel, re manufactured by AW engineering. This vehicle has been fastidiously maintained and won awards such as Show n shine winner 2016 Big Bang. Our sister company Campervan Coachworks has maintained this vehicle over the last 9 years. The current owner has added many useful and tasteful upgrades such as alarm/immobilser, tracker, premium Alpine entertainment and so forth. Running gear includes AVO lowering kit with adjustabnle shocks and Ronal 16inch alloys. I can send you a PDF of the full spec and also a huge library file. The current owner has invested £30k into this van, so £20k is a fair price to own probably the best California in the UK. Sale does not include private number plate, it is now registered as G981BJO and includes a new MOT without advisories. More photos of interior to follow. 2003, 2.5tdi 151ps, 5 speed manual with 125,300kms, full service history, recent cam belt and water pump. MOT 11 months with advisory tyre replaced. In superb rust free condition and includes: air condtioning, heated seats, cruise control, headlight washers, satelite navigation, remote locking with immobilser. 16 inch VW alloys, fiamma cassette awning, bike rack. 4 berth, 2 doubles, eberspacher heater, waeco fridge/freezer chest, 2 sinks, bathroom with toilet/sink/vanity unit and shaver socket. Large wardrobe, 2 tables, overhead lockers, curtains all round. 240v hook up point with RCD/charger and large leisure battery. 240v and 12v sockets, 12v lighting, twin gas hob with sealed gas bottle container and isolation valves. On board fresh and waste water tanks. Digital control panel indicating habitation appliances and temperature settings. This model is the precursor to the T5/6 Club Joker. 2008 136psi, 6 speed manual, air condiotining, swivel captains seats, 91000 miles, RHD speedo/lights, LHD steering, 4 berth, double in roof and lower bed. 5 seater with 3 point belts, big heiki electric panoramic sunroof with blinds, shower room/toilet, webasto heating and hot water, galley kitchen, awning, alloys, reverse camera, full service history, solar panel off grid camping, blinds, large waeco fridge, supplied with new service and warranty. extras include: memory foam for upper and lower bed, full set of crockery/pans, silver screens , hook up cable, big awning with side screen and alloys (2 missing centre caps will be replaced) Or buy this model new from £77000? 2006, 2.2cdi, 74000 miles, full MB service history. Automatic, cruise control, climate control, upgraded MB command system with sat nav and reverse camera on dash screen. Parking sensors front and back and tow bar. Front swivel seats with additional seat covers. 4 berth with 2 doubles and upper child safety net. On board water tanks, digital control panel, recent new leisure battery, mains connection, 12v lighting, thermo screens for pop top and cab. Waeco fridge, eberspacher heater, sink with mirco switch, tinted privacy glass, LWB and masses of space/leg room. Electric rear seats, storage compartments including wardrobe and swivel cabinet, pocket systems. Louvered doors. Twin gas hob, gas bottle, table and curtains. Alloy wheels compliment this top of the range Westfalia camper. Roof bars and luggage hooks for floor area. 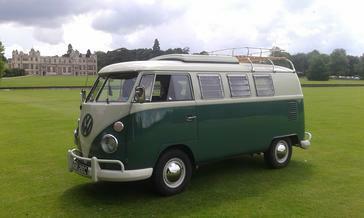 1965, 88000 miles, fully restored, stunning in Velvet green(original colour code) with pearl white. Imported from Pennsylvania last year where it spent all its life from new. Dry stored for 19 years between 1995 and 2014 in one family ownership. Now 1 UK owner, MOT'd with over £20,000 spent supported with recent invoices and photo restoration record. Time and money spent on detail as it only required 5% welding. Completely factory original as it came from the showroom with original pieces restored and perishables replaced including newly remanufactured 1640cc engine. Includes, manuals, invoices, cab bunk, original big top awning tent, gutter rail, historic dating certificate. Complete and beautiful.